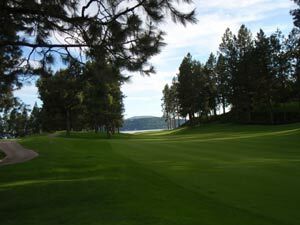 Coeur d'Alene Golf & Spa Resort sits on the banks of the absolutely beautiful Coeur d'Alene lake and has one of the best golf courses in the United States. Prior to becoming a golf course, the site was home to a sawmill that operated form 1916 until the property was purchased in 1988 by the Hagadone Corporation. Because the property had been idle since 1970, a substantial clean up effort was necessary to remove hundreds of old pilings, clear tons of sunken logs from the lake bottom, and demolish a large number of building. The end result was the world famous Coeur d'Alene Golf & Spa Resort. You can learn more about the resort by visiting their website or reading our brief comments on the resort. 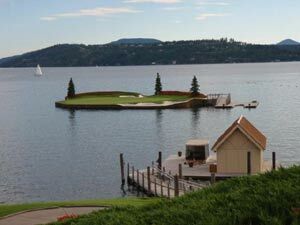 The entire Coeur d'Alene area and resort are fantastic, but we came here for the golf and it's famous (infamous in my case) 14th hole………….the world’s only floating green. The green is built on a giant raft which is on a set of cables that can be moved so the par-three plays different distances from shore each day. Because the green moves, there is no bridge to the green, instead a Coast Guard licensed captain whisks you from tee to green in a small boat to putt out, and then takes you back again. This is typical of the character of CDA. The course is on prime lakefront in a cove around a bend from the resort and you boat over in beautiful handmade mahogany runabout from the hotel lobby to the clubhouse. One of the highlights is playing the 14th hole. Distances on the scorecard include an asterisk on #14 showing 218 yards from the tips, 147 from the middle, and a short 95 yards from the forward tees - but the yardage varies with the wind and the positioning of the floating green so be sure to check the daily sign on the 14th tee. During my warm up of hitting floating golf balls, I practiced hitting a 165 yard shot into the prevailing headwind off the lake to be sure I’d do justice to this famous shot. I was so confident I had the shot I gave my camera to our excellent forecaddie, Bill Scheffer, to video my moment of fame. Yes, I chunked a fat shot into the lake. My ball now sits beneath the floating 14th green - probably with 10,000+ others! Regardless of whether you successfully hit the floating green with your tee shot, you still board a motorized ferry complete with drinks and candy and boat out to the floating green. The green is immaculate and has three pine trees, two sand traps, and thousands of blooming geraniums. If you failed to land safely on the floating green you simply take a one stroke penalty and drop on the green far from that day’s pin placement and putt away. I three-putted for a double bogie when I was thinking, actually hoping for, a birdie or par. But it was certainly unique and fun. 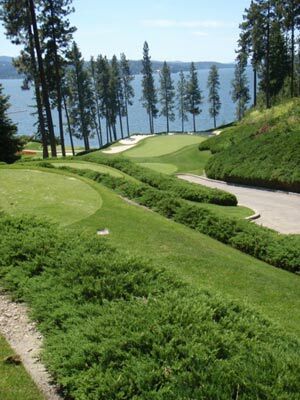 All of Coeur d'Alene's par 3s are exceptional. For example, #5 is a a breathtaking downhiller protected by four big sand traps and two giant rock outcroppings. A par on this beauty made me feel a little better! 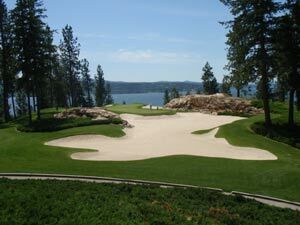 I’ve heard some criticize the Coeur d'Alene Golf Resort course as being “too perfect”. The fairways are cut as short as most Texas greens and the grass in the “roughs” is short, clean, soft and beautiful---and easy to hit from. But I loved it and I think most visiting golfers of any ability would agree. Head Golf Pro, Andy MacKimmie, will give you some tips on how to play the course and some very interesting info on the history of Coeur d’Alene. When I played in June the course was in near perfect condition. One reason the conditions are so perfect is that carts are required to stay on the paths but a very helpful forecaddie per foursome runs the proper clubs and gives helpful tips to all his players. 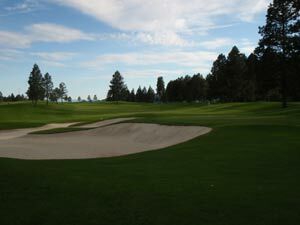 The fairways and greens are cut at night to assure that all you’ll experience is the undisturbed beauty of a perfect golf course with a cool breeze off Lake Coeur d’Alene, the calls of the seagulls, and an occasional splash from a poorly played tee shot on #14. 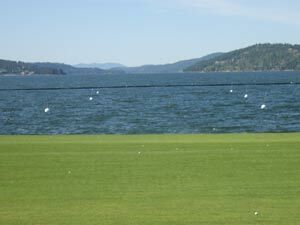 The Coeur d’Alene Golf Resort practice range is also unique. 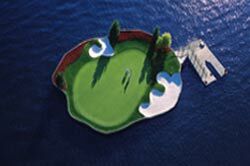 You’ll hit floating golf balls (that fly about 75% the distance of a regular ball) south into Lake Coeur d’Alene. They’ll drift back to shore for collection that night. What a special place and a welcome escape from the Texas heat. I now understand why Coeur d'Alene is known as “The Playground of the Northwest.” To learn more about Coeur d'Alene Resort visit their website for pictures, videos, pricing, and more.